I used my standard finish on all the boxes which is General Finishes Oil & Urethane Satin thinned with Mineral spirits 2:1. I like this finish because it is very forgiving. I get a lot of open time where I can deal with drips, pools and dry spots. Since the finish is thinned it self levels very nicely and since it is self leveling I can apply it with a rag instead of a brush. This means I can use a disposable shop towel and when I am done applying finish just hang the towel to dry. Once dry I just throw it out in the garbage. This makes cleanup a breeze. The finish cures quickly enough that I get very few dust nibs too. There are exceptions. 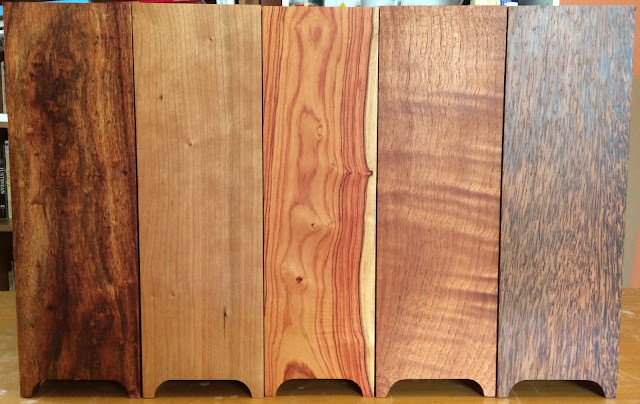 Some woods like cherry can end up looking blotchy with just an oil finish on them. Another issue comes up with woods that have a lot of natural oils in them. In these cases the oil in the wood keeps the polyurethane from curing correctly. I don't know of any North American woods that have too much natural oil; however, quite a few imported species do. This is why I always try my finish on an offcut first whenever I'm not familiar with a species. The fix for both of these issues is to seal in the problem with shellac. Shellac doesn't have the same refraction properties as oil so it doesn't cause blotching and seals the pores so oil finishes put on top don't blotch. It will also seal in issues with oily woods. I didn't have any oily woods in my magazine boxes but I did want to try sealing the cherry. We - my wife and I - were sending a miniature plinth for a friend that was so oily that we needed to seal it before putting my oil & urethane on it. Since I was going on a trip, my wife volunteered to do share the finishing for me. I have such an awesome wife. We started by putting shellac on the plinth and the cherry magazine box. I gave the cherry magazine box a very light sanding them started putting the oil and urethane wiping finish on all of them. The downside of the wiping varnish is that the coats are so thin it take a lot of them to get a good coat. I got the first couple of coats before I left on vacation and my wife did the rest while I was out of town. When I got back from my trip I rubbed the boxes down with kraft paper - brown paper bags - to remove the few dust nibs, filled them with magazines and put them on my shelf. I'm pretty happy with how they all came out.